The winning recipe replaces some of the butter with sour cream, blends cocoa powder and bittersweet chocolate, and employs a shot of chocolate syrup to maximize chocolate flavor. 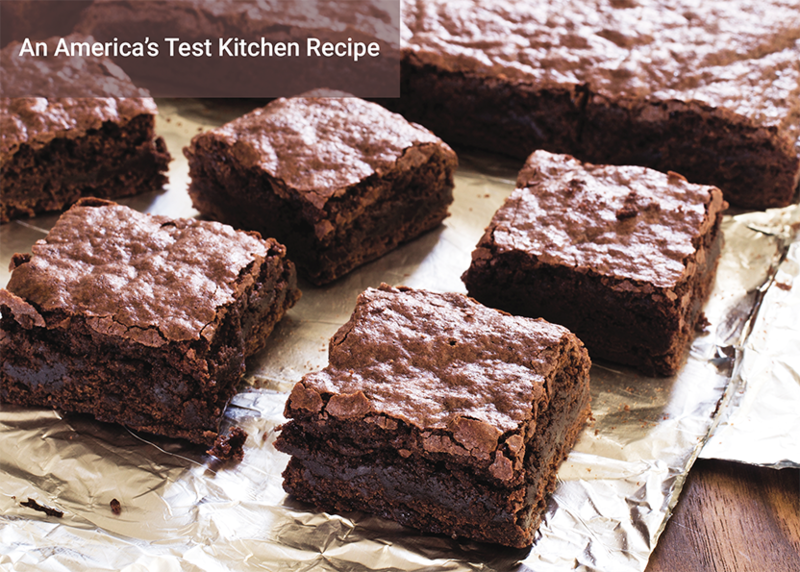 These brownies contain half the calories and fat of traditional ones, making them heart-healthier! Note from the Test Kitchen: Melt the chocolate and butter together in a bowl set over a pan of simmering water or in a microwave set to 50 percent power. For a truly fudgy consistency, don’t overbake the brownies; as soon as a toothpick inserted into the center comes out with sticky crumbs attached, the brownies are done. If the toothpick emerges with no crumbs, the brownies will be cakey. (overhang will help in removal of brownies). Repeat with second sheet, placing in pan perpendicular to first sheet. Spray foil with cooking spray. bowl until smooth . Cool 2 to 3 minutes, then whisk in sour cream, chocolate syrup, vanilla, egg, egg white, and sugar. Using rubber spatula, fold dry ingredients into chocolate mixture until combined.